I totally slacked on running this week. On Tuesday it was too hot still at 7pm with a heat index of 100. Then on Wednesday and Thursday, it rained all afternoon and evening. But at least I got a race in on Saturday! 1) I survived the first week back to school! I actually have a really great group. The kiddos have already caught on to most of the routines. They're so cute and eager to learn. And I have a big bunch of huggers--they're adorable! I am exhausted though! 3) I haven't run since last Sunday. Tuesday was too hot in the evening with the heat index still over 100 degrees at 7pm. Then it rained all afternoon Wednesday and Thursday. Honestly, I'm glad though. I'm kind of burned out on running training runs. 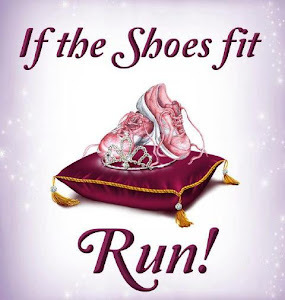 And considering marathon training starts in 2 and a half weeks, I need to get motivated! If only I could just run lots of races for training runs! 4) I'm all set for the Gridiron 5k tomorrow. I'm so excited to be decked out in my Gator colors tank and Rock City skirt! (and football season starts a week from tomorrow. I can't wait!). 5) In one week from now, I'll be out at Disneyland getting ready for Dumbo Double Dare! Hopefully I'll meeting up with some friends at Trader Sam's right about now and celebrating my bday a little early! 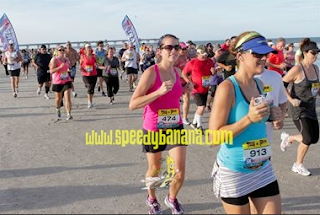 I woke up early the Saturday morning expecting to be sore from the 4 mile beach run the night before but I wasn't. 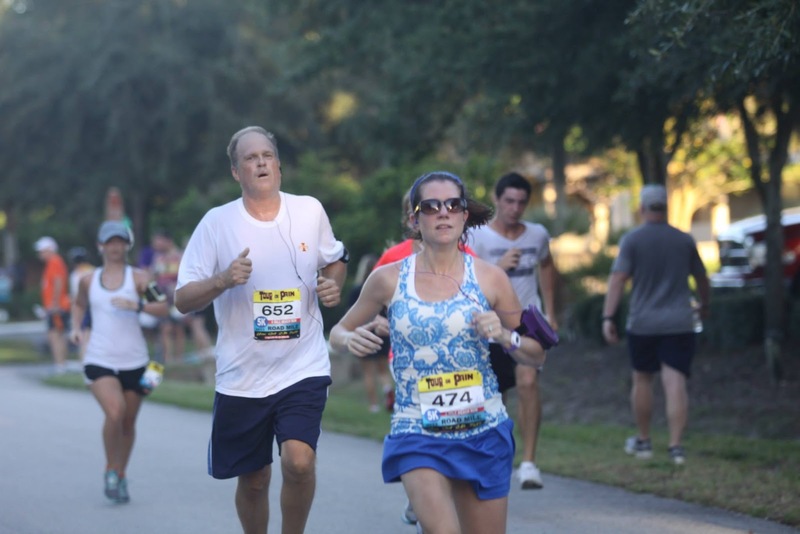 I headed over to Kristin's bright and early and we drove to the Tour de Pain 5k with her hubby and brother. Once again, I didn't really have any goals. I wanted to try to run the whole thing again but wasn't sure how my legs would feel once I got going. Kristin and I lined up a little ahead of the boys. 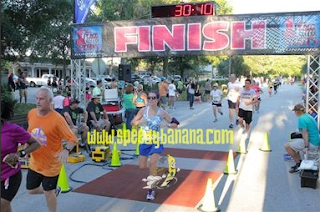 I knew that I wasn't going to stay with her because her 5k times are a lot faster than mine (and she even got a 1 second PR!!). We took off and I realized I was tired but not that bad. I could run the whole thing! I was ahead of the boys for a while but then Adam and Damian passed me by. I was okay with it though. I kept them in my sights. They had told me a story the night before about how at one of the races, Damian had stayed right behind Adam and at the VERY LAST SECOND stepped ahead of him to beat him by 1 second! I thought about trying to do that with one of the guys but decided I couldn't keep up. (I did end up passing Damian again because his knee started bugging him). I don't think there was anything for me to drink again (only water) but I don't remember. Here are my stats...I missed a PR by 7 seconds! Not too bad! There was a sale going on a 1st Place Sports so we looked around for a bit and tried to pick up our race packets for the Drenched 5k which was the next day but we couldn't yet. So we headed home. We had another race in 9 hours! I was excited to run in the Tour de Pain. 3 races in 24 hours was a great challenge. 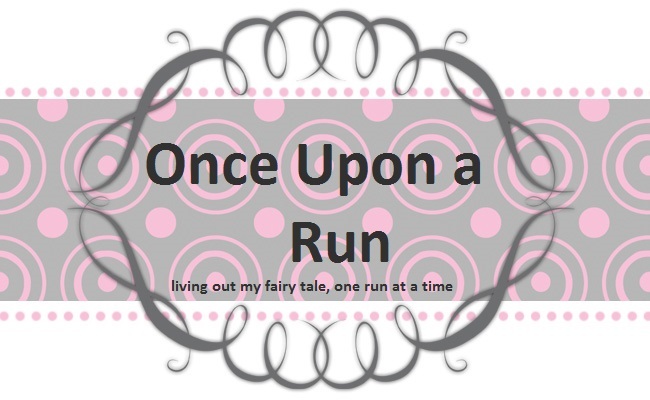 (well, 4 if you count the fun run we did on Sunday!) 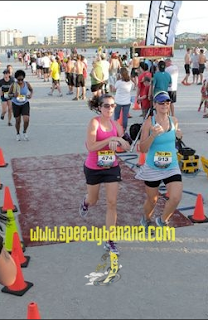 I was running all of these with my friend Kristin (A Mom on the Run) from high school. Her hubby and brother were also running the Tour de Pain. I was ready with all of my outfits (and Bella supervising). First up was the 4 Mile Beach Run. I was a little unsure of this one. I'd run on a beach once before and I remember being sore the next day. I was wishing this was the last race instead of the first. 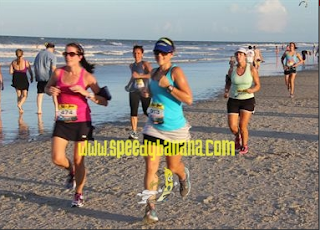 And since I had no idea what effect the beach run would have on me, I didn't really have any goals at all for any of the races. 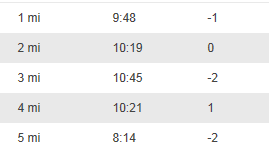 I wasn't even sure if I was going to run the 28 minutes that I had been getting up to, start off right away with my 2:1 intervals, or somewhere in the middle. Anyways, we took off and Kristin and I ran the first bit together but she slowly started to pull away. I didn't want to slow her down since she's quite a bit faster than I am so I let her go. I ended up running for about 18 minutes before stopping and doing my 2:1 intervals. Kristin didn't realize that I had slowed down until after the two mile mark so she stopped and stretched some and waited for me to catch up. Then she did the intervals with me. We kept our eye on the boardwalk since we knew that we didn't have to go past that. But it sure seemed to take a while to get closer! We saw the finish line and took off. So I realize that I need to find a more graceful way of stopping my watch. Apparently I just look silly when I do it. Kristin looks so much better crossing the finish line. 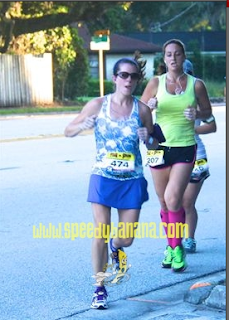 We finished at the same exact time, then Kristin's hubby came in next, then her brother. I came to the realization that beach running is hard because you have to pay attention to your steps. I wasn't sore the next day, but it took a lot of focus and my ankles were wobbly. 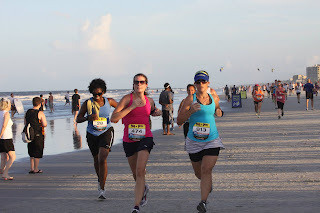 I don't think they announced that there was going to be a run on the beach because there were still lots of visitors so we had to run around sand castles, holes, and beach chairs! I'm not sure I'd do another beach race. It wasn't as bad as I was expecting and the ocean was beautiful, but I think I'll stick to the regular roads. 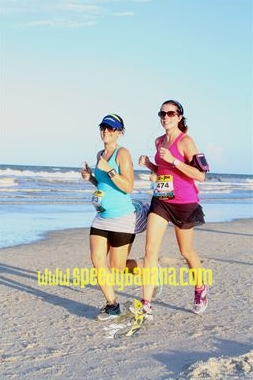 After the race, I realized I hadn't gotten pre-race picture like I normally do, so I asked Kristin's hubby to snap a picture of us. Apparently he has the same humor as my hubby does, because here's the picture I got. Adam then took real picture of us. The ocean in the background is just gorgeous! My only real complaint is that there was only water to drink after the race. And since I don't drink water, I didn't have anything until we got to the car. They did have really yummy cookies though! The official results were gun timed, not chip timed. My official time was 42:11 with a 10:33 pace. I was 132 place overall and 22nd place in my class. We stopped for dinner and then headed home. We had less than 11 hours til the next race. Last week I completely skipped a run, with no make-up run, for the first time all summer! It was just too hot to run after work, even in the evening. Marathon training starts soon and its going to be tough to get the weekday runs in. I can't wait for Fall weather! We ran 5 miles yesterday and 14 miles today. Bring on Dumbo! In less than 2 weeks, we'll be out enjoying Disneyland. I can't wait!! First day of school is tomorrow! Wish me luck! 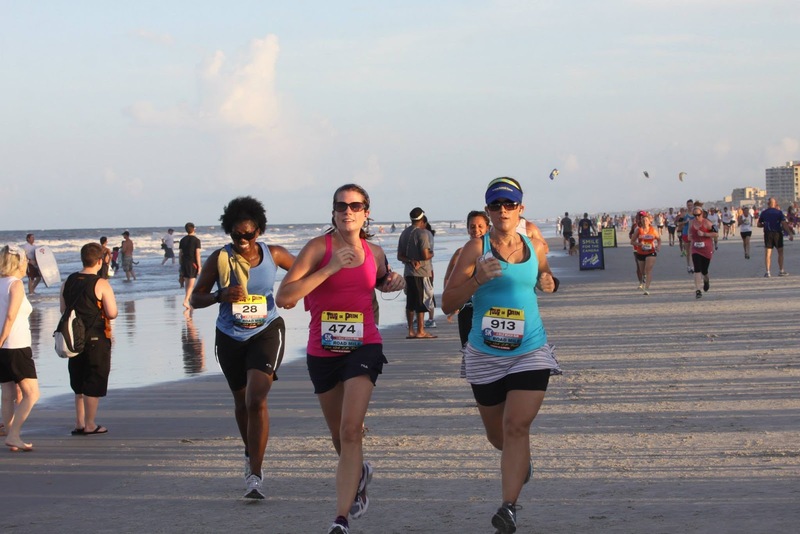 Tomorrow I will be participating in the August Half Marathon Virtual Race for Jost Running. 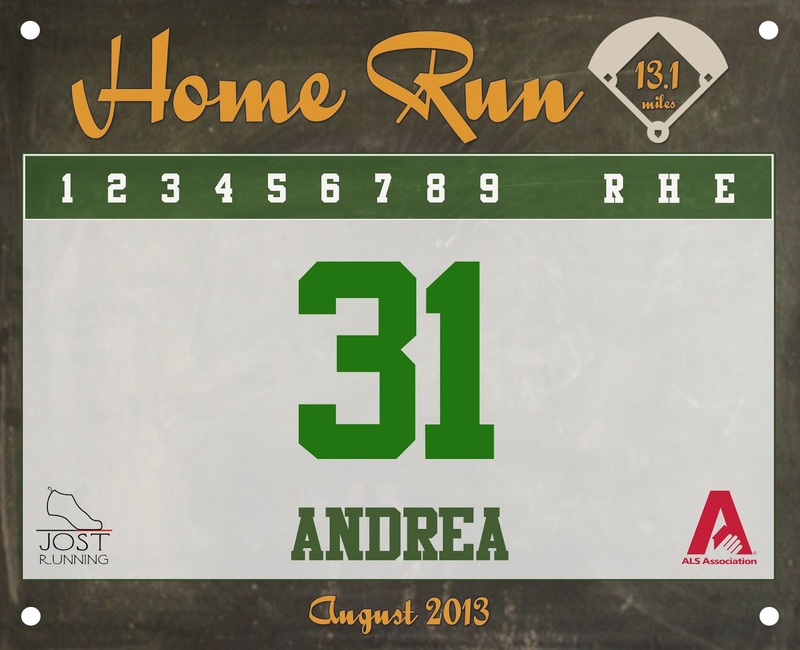 It's part of the Home Run Series. 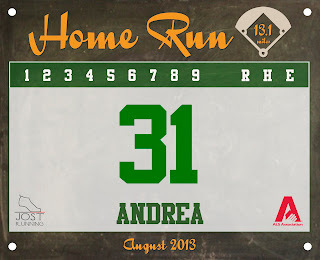 1) I got my August Stride Box last week. Some great things were in it! ~Stride Cool-Post-Run Cooling Towel. I can't wait to try this after my 14 miler on Sunday! 2) For the first time this summer, I skipped a run without making it up (I don't count last week's as skipped since I was purposely saving all my miles for the 4 races during the weekend). I was supposed to run last night but after Meet the Teacher, I was just plain exhausted! Luckily it was storming by the time I got home so I only feel slightly guilty for skipping. But I had been doing so well. 3)Getting in runs these next few weeks is going to be tough. On Tuesday at 7pm, it was still 96 degrees with a heat index of 100. So I skipped the run. It was just too hot. To make up for it, on Wednesday, I tried the whole getting up and running thing before work, but I was a little late to work (it was only pre-planning so okay that I was late) and I was exhausted all day from being up so early. My body can't handle that being a regular thing. So I'm not sure how I'm going to get the runs in unless it rains early enough that I can run afterwards. It's too hot to run if it hasn't rained (and I'm not comfortable running in the dark) and I just can't do it before work. So here's hoping it either rains for a short time every afternoon/evening or the temps drop really soon! 4) Yesterday was our Meet the Teacher. It's always such a stressful time but so much fun too. I love meeting all my new kiddos for the first time. They're such babies at the beginning of the year. By the end, they're so much more independent. Monday will come quickly. It's always chaotic on the first day. And I think it's harder on the parents than the kids. 5) I got my first Pro Compression socks in the mail today. I love the color! I can't wait to wear them on Sunday after my long run! I recently made another great Publix Apron Recipe. Combine buttermilk, garlic, salt, and pepper. Place fish in buttermilk mixture, turning to coat; let stand 3–4 minutes. Preheat large sauté pan on medium-high 2–3 minutes. Place potato flakes on plate. Coat both sides of fish with potato flakes; press with fingertips to coat heavily (wash hands). Place 2 tablespoons butter in pan, then add fish; cook 4 minutes (do not turn fish). Place 1 tablespoon butter in center of pan. Turn fish (using spatula), distributing butter under each fillet; cook 3 more minutes or until golden and fish flakes easily. Serve. Break broccoli into bite-size pieces, if preferred. Combine broccoli and water, then cover; microwave on HIGH 4 minutes or until tender. Drain; stir in remaining ingredients. Serve. I also served the dish with some rice side dish., The fish was so yummy! I'll definitely be making this one again! 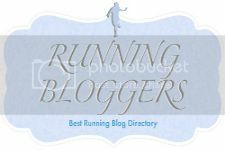 Alicia over at In Healthy Habits We Trust asked me to think about what the future of running will be like. In the fun, futuristic way. Creative thinking (and wishing!) at its best! 1) Color changing shoes. I'm one of those types of people that has to match. My shirt has to match my shorts/skirt which matches my socks, which matches my Sweatyband. But there's nothing I can do about changing the color of my shoes. In the future, you'll be able to set it up on the computer so you can change the color of your shoes to match your outfit or mood for the day. 3) Ice packs and ice baths no longer! There will be a device that shoots a blast of super frigid air to the area that will have the same effect as icing that area! Woohoo! 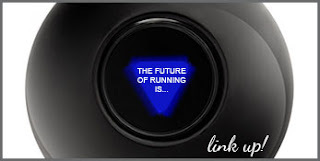 What do YOU think the future of running looks like? 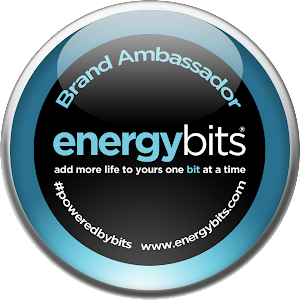 let me know in the comments and then head over to In Healthy Habits We Trust to join in the link up! to get the code for the banner, see the very end of this post! I am so, so sad that summer is over. I start back to pre-planning next week. And I'm dreading it because that means no more early morning runs during the week. I'm planning on running around 7 at night (since I have to run before we eat otherwise I get bad cramps and this is about as late as I can go). But tonight at 7 it was still 87 with a heat index of 93. It's going to kill me! I didn't do any training runs this week. I saved them all for the races this weekend. 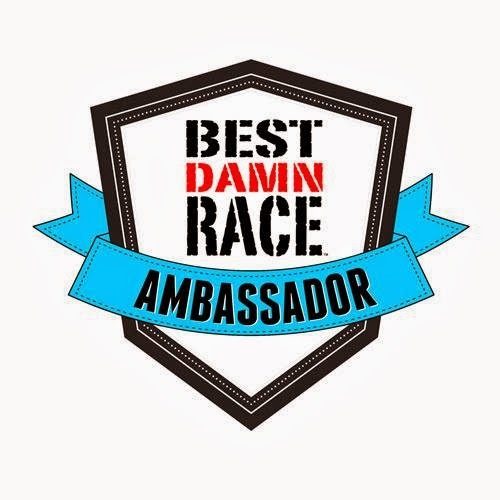 Kristin from A Mom on the Run and I ran 4 races in 36 hours! So much fun! Sunday morning--Drenched 5k--we ran with Kristin's son so we walked almost all of it. We didn't time ourselves and it was nice to chat and get wet. 2) I am also running some virtual races for Jost Running. I will be running the August Home Run 5k on Saturday when I am running the Tour de Pain 5k. I won't be wearing the bib, but it's so cute! 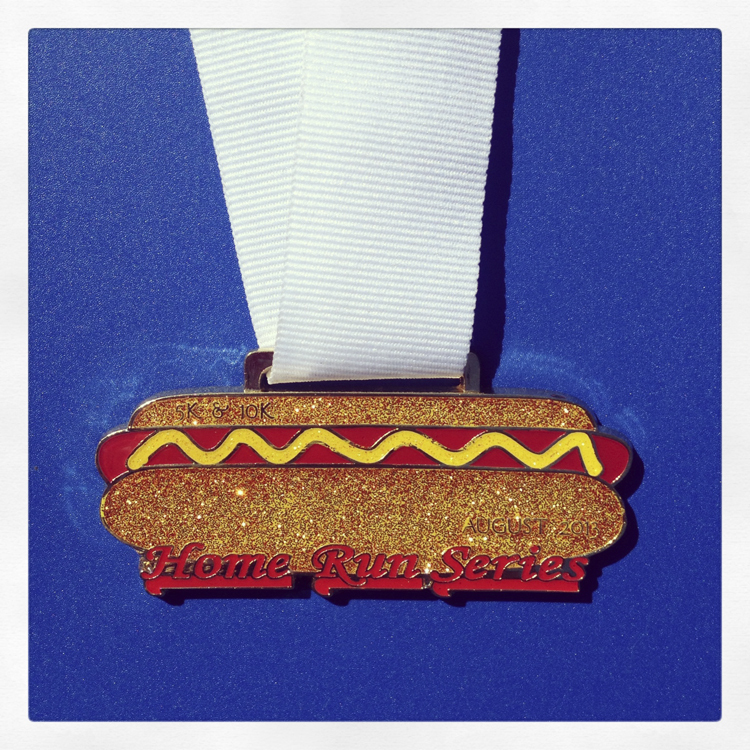 And the medal is a hot dog! 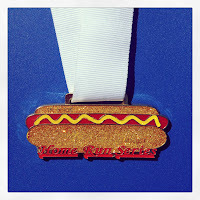 I'll be submitting my times and I'll post a picture when I get the medal. 4) I can't believe the summer is already over! Pre-planning starts back at school on Monday and Meet the Teacher is Thursday afternoon! 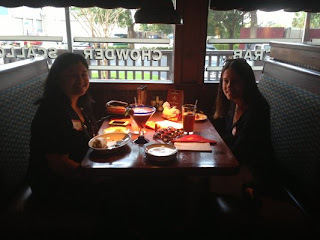 So last night I headed to the Red Lobster in Clermont for a blogger dinner. I knew this was a smaller setting and I wouldn't know anyone so I was a little nervous. I was glad that I was able to bring my husband--I'm pretty shy. But I shouldn't have been! I left the dinner thinking about how it was so much fun and I loved that it was a smaller setting! I saw a couple of the girls from the Yelp event the night before. Summer, Heidi, and Vanessa remembered me and said hello. They were the gals in charge of the event. We also met the general manager of the store, Kellie. When we sat down, we were able to order whatever drink we wanted. I decided to try the Berry Mango Daiquiri. It was so pretty when it came out and tasted delicious! And I dug into the biscuits right away. Some Seaside Starters (appetizers) came out-- the Southwest Chicken Pizza, Spicy Buffalo Chicken Bites, Lobster-Crab-and-Seafood-Stuffed Mushrooms, Parrot Isle Jumbo Coconut Shrimp, and Sweet Chili Shrimp. I helped myself to all of them except the buffalo bites (oops--already ate some before I took the pic). Kory kept trying to get me to try a little of the buffalo bites but I'm a wimp. I did steal a piece of the blue cheese though. My favorite is still the mushrooms. So yummy! When we were full, the wonderful wait staff (Drew and Kim) boxed up the appetizers and put them in the beginning of our to-go bags! And we got to learn some interesting things about Red Lobster that I didn't know. The restaurant we were in was the prototype and the restaurant is modeled after Bar Harbor, Maine. The East Colonial Drive and Sanford restaurants are trying out a new service called Seaside Express Lunch. You order and pay when you arrive, grab a number and a seat and lunch is served very quickly and should be under $10. These are the only 2 locations in the country to be trying this. They started a new menu last Fall with "Maine stays". These are food options that will stay on the menu and not vary. There is a Happy Hour from 3-6pm with drink specials and $5 appetizers. There are also special menus available--a Lighthouse menu with lighter options and an allergy menu. For dinner, I had a half dozen steamed oysters and snow crab legs. I chose a Caesar salad to start. The oysters were yummy. Sometimes they can be too chewy or sandy and gritty, but these were just right. And the crab legs--delish!! I sure made quite a mess but it was worth it! Kory had the Bacon-Wrapped Shrimp and for dessert we split the Warm Chocolate Chip Lava Cookie. Kory really enjoyed the peach-bourbon BBQ glaze on the shrimp. And the cookie--it was heavenly! A warm chocolate chip cookie with melty chocolate in the middle topped with ice cream?? It can't get better than that! And the conversation was so much fun! Jen had new Google Glasses she was trying out so she was passing them around (Kory tried them). And Bess, Joe, Vanessa and I talked about our time in Gainesville and the Gators. The conversation just flowed. There was no awkwardness and it was just plain fun! Oh, and I can't forget about the awesome swag! A lob-stah tote and a very generous gift card! Thank you to Red Lobster and to Heidi, Vanessa, Summer, and Kellie for setting this up! What a great event! I met up with my friend Cecille last night at the Orlando Yelp event at the Red Lobster on East Colonial Drive. Red Lobster went all out with this social group! We were provided 2 drink tickets when we arrived. I ordered the Sunset Passion Colada. Oh my. This was sooo good and refreshing! I would definitely order this again! They brought out some appetizers. My plate doesn't look very pretty (Sorry, I had already dug in when I remembered to take a picture!) I had the Sweet Chili Shrimp and the Lobster-Crab-and-Seafood-Stuffed Mushrooms. (And the Cheddar Bay Biscuit of course!) The shrimp definitely had a kick, but the sweetness made it tolerable for me (I'm a wimp!!) But the mushroom was my fav! Then they placed some additional appetizers out for us to enjoy. I had to try a little of everything, of course! The Southwest Chicken Pizza was yummy and had a kick, as did the fiesta salad. I loved the salsa on top of the shrimp taco! They also had Tilapia off their Fresh Fish menu. Up next, it was time for another drink. I got the Island Colada Especial. It normally comes with a sidecar shot of Disaronno Amaretto and sprinkled with nutmeg, but I declined both. This tasted soo banana-y which is just what I wanted! They brought out some more entrees for us to enjoy. Both of these were amazing! The grilled cheese was so grown up and the Parmesan Chicken Alfredo is perfect for the non-seafood lover. I sampled the Chocolate Wave cake and the Carrot Cake. The Chocolate Wave cake was so decadent. Five layers of chocolate---yum! And we even got swag! A cute lobster tote bag and a gift card! I had a great time with Cecille and the Yelp gang!